Elfs or Elves – What’s the Difference? Home » Elfs or Elves – What’s the Difference? If you are living in a fantasy world populated by humans, orcs, dwarves, and other fantastical creatures, you should be careful to call each race by its proper name. In such a crowded world, tensions are likely to be high. If you are speaking with more than one elf, should you call them elfs or elves? If you get it wrong, you might be shot between the eyes with an arrow, so pay attention. What is the Plural of Elf? 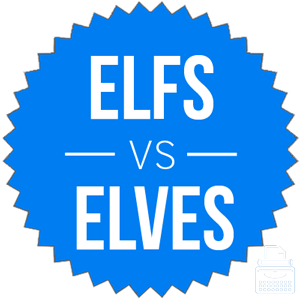 In this post, I will compare elves vs. elfs. I will use the correct form of the word in several example sentences, so you can see how it appears in context. Plus, I will show you how to use a memory trick that makes remembering whether to use elfs or elves much easier. What does elves mean? Elves is the plural form of the noun elf, which refers to a fantasy creature. Elves have been part of Germanic folklore since medieval times, where they were usually depicted as having a similar appearance to humans. They often had supernatural powers, and were sometimes considered potentially dangerous, but aloof. In J.R.R. Tolkien’s legendarium, elves are immortal, and have a roughly similar appearance to humans. In most adaptations, they are portrayed with pointed ears and long hair. Today, elves are often portrayed as diminutive and mischievous outside the high fantasy genre. They might help Santa Claus in his workshop, for instance, or bake cookies in hollow tree trunks. A war broke out between the elves and the dwarves, which lasted for a thousand years and left the earth stained with blood. In the movie Elf, Will Farrell portrays his elven character as energetic and effusively joyful. What does elfs mean? Elfs is a common spelling error for elves. Since the singular root is elf, English users who are unfamiliar with pluralization rules might use this backformation under the assumption that elf forms a plural by adding a simple -s, like many other nouns. Modern spelling conventions usually change f to ve at the end of a word when forming plurals, though. Other examples include hoof and hooves, shelf and shelves, and calf and calves. Since every rule has its exceptions, roof is still pluralized to roofs. It isn’t scientific, since it only looks at books published in English since 1800, but it still illustrates a long-term usage trend. You should only use elves when referring to more than one elf. Elfs has not been common for at least 200 years—if it was ever common. So, what is an easy trick to remember elfs vs. elves. Use the rhyming words elves and shelves any time you need a reminder that elves is the proper plural of elves, just like shelves is the proper plural of shelf. Is it elfs or elves? Elves is the plural form of the noun elf, which refers to a fantasy creature. Elfs is a misspelling that you should avoid in your own writing. 1 What is the Plural of Elf? Addenda or Addendum – What’s the Difference?